Is your dog pulling you on the leash? If so, then you’ve come to the right place. 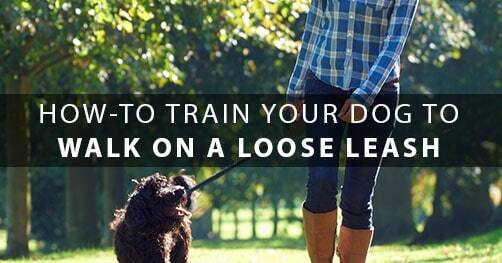 In this training guide, I’m going to share with you four training steps to getting your dog to walk nicely on a loose leash with you and to stop pulling once and for all. Now, before we dive into the actual training, I’d like you to meet Sophie. This is a picture of Sophie on the very first day I met her. You see, I met Sophie because my friend was having an extremely difficult time walking her. She would pull on the leash, bite the leash, tug on the leash, lunge at anything that moved, jump up, and bite clothes and shoes. Although your dog’s pulling behavior might not be as bad as Sophie’s was, I want to share with you exactly what I did to train Sophie. 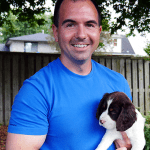 This way, you’ll get a real-life example of how my training methods can be applied and get some insight into how to use them with your own dog. The sad truth is that there are many ways of training a dog. And though all training methods do work in their own ways, I’m what you could call a gentle soul and have a strong belief that inflicting physical pain on a dog during training is unacceptable. That is my own personal belief, and it has forced me to think “outside the box,” so to speak, and train using a different method—with positive reinforcements (or force-free, as some would say). Before I give you training advice on what to do, it’s really important that you first understand WHY your dog is pulling on the leash in the first place. Pulling on the leash is not a natural behavior that your dog is born with. Why would a dog want to strangle himself to the point of gasping for air? The main reason a dog pulls on the leash is because it’s a reinforced behavior. Yep, in one way or another, your dog is being rewarded for pulling (I’ll explain how below), and most dog owners aren’t even aware of it. John decides to take his dog to the park for a game of fetch. He knows how much his dog loves this game, plus it’s good for his dog’s health and well-being. So they start walking, and his dog pulls and drags him all the way to the park. They then proceed to play fetch for ten minutes. This might be a pretty obvious example, but the act of playing fetch (which is something his dog loves more than anything else) will reward any behavior that occurred before, including the pulling. If you look at it from the dog’s point of view, why wouldn’t he pull? The faster he gets to the park, the faster he will be able to play fetch. And if his owner isn’t aware of what’s happening and how this is rewarding his dog for pulling, the behavior of pulling will get worse over time. Imagine that this scenario is repeated daily for months. This is how pulling becomes a big problem, and if nothing is done, John will end up with a sore shoulder and wrist and begin to resent walking his dog. Whenever your dog pulls on the leash, especially if your dog is trying to get to or at something, stop walking and wait for the leash to loosen. An even bigger deterrent is to turn around altogether and walk in the opposite direction. What does this do? Remember, your dog is pulling to get to something more quickly, and stopping, walking, or turning around creates an incentive to keep the leash loose. This is exactly what I did with Sophie (which you can see inside my Walk in Harmony Game Plan). Sophie would pull because she wanted to go to the park and sniff the grass. She would pull when she wanted to meet another dog or stranger or whenever there was an object on the floor she wanted to sniff and investigate. I had to teach her that pulling would delay the time before she could get to those things. And it worked! You can do it too. All you have to do is commit to practicing this simple exercise with your dog for the next week or month. Now, before you go ahead and try this exercise, you first have to take into consideration how long your dog has been pulling. If your dog has been pulling for months or even years, then it’s going to take considerably longer to undo this conditioning. Pulling is like a bad habit, and habits are hard to break. It simply takes time, dedication, and consistency. The second biggest factor that will influence your dog’s walking behavior is whether you are rewarding your dog for walking nicely with you. You would be surprised by how many dog owners I’ve worked with who don’t actively do this. And I don’t blame them; our society has programmed us to adopt a punishment mind-set. We are used to looking for ways to punish or suppress bad behaviors. Here’s a personal example. In one of my relationships, my girlfriend really wanted me to call her every single night. If I missed just one phone call, however, she would become angry with me and let me have it the next time I called her. She wanted me to call more often, but her approach was to punish me for not calling, so when I did call, I received lots of pain. What do you think ended up happening? You guessed it—the frequency of my phone calls lowered until one day our relationship ended. Traffic tickets are another example. We all know that speeding is bad and we shouldn’t do it. But let’s be honest—the real reason we don’t speed is because we don’t want to get a speeding ticket. We don’t want the burden of dealing with a police officer and having to pay the fine. And a speeding ticket will usually drive up the cost of car insurance. Most of us want to avoid the consequences of speeding. But what if we flipped the psychology, and instead of punishing the “bad” behavior, we rewarded the “good” behaviors? What if a cop pulled you over and handed you $50 for driving the speed limit? Would you be more or less likely to drive the speed limit in the future? My guess is that you would be more likely to do so. Of course, this wouldn’t be practical because it would cost a fortune. Luckily, there aren’t any limits on the amount of positive reinforcement you can give your dog. You can easily reach down and give your dog a pat on the back while saying “good dog!” for walking nicely at your side. And here’s the kicker: the more often you reward your dog, the more your dog will want to walk nicely with you. The behavior will grow over time. This is exactly how casinos work. A casino never forces anyone to play a slot machine, but if you walk into any casino, you will find someone playing—and most likely losing money. How do casinos do it? It’s simple! The casino rewards the player for playing! Everyone who walks into a casino has the dream of walking out rich, of making an extra $10,000 or even $1,000,000. That rarely happens, though. What casinos do instead is give smaller rewards randomly. Imagine you are on your tenth play and all of a sudden your slot machine starts making noise, the siren goes off, and your machine rack up points for two entire minutes. Everyone around you smiles and congratulates you on your big win. You’re now just a little bit ahead. And what do you do? You guessed it—you keep on playing in hopes of getting an even bigger prize. This is exactly how you want to think when training your dog. You want your rewards to build the behavior of walking nicely with you. And it’s extremely simple to do, as I show in my Walk in Harmony Game Plan. First, you will need to make a list of the behaviors you want to reinforce. These might include walking at your side, looking up at you, stopping when you stop walking, keeping up the same pace as you, ignoring objects on the ground, ignoring other dogs, etc. Then simply give your dog a reward for engaging in those behaviors. The reward can be anything: saying “good dog” in a cheerful and happy tone of voice, touching and patting your dog, stopping and playing a quick game of tug, or giving your dog a delicious treat. The key is to give the reward immediately after the behavior so your dog makes the association between his behavior and the reward. I wish I could tell you that you can get your dog to stop pulling in one afternoon. It would make a great marketing sound bite. The reality, however, is that it’s probably going to take longer than that. It really depends on how long your dog has been pulling. For example, a dog that has been pulling on the leash for five years has developed a habit that will be harder to break than the habit of a young puppy that is just learning the rules of walking. But no matter how long your dog has been pulling, you can change the behavior. The key is to focus on progress instead of perfection. 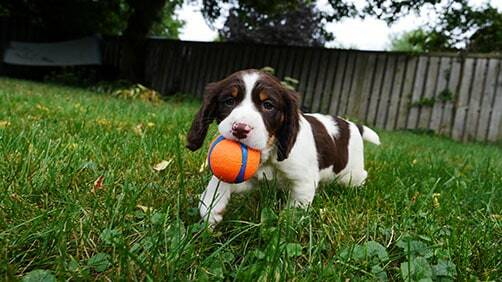 What you want to do is to focus on improving your dog’s current behavior. If your dog can only walk four steps before pulling on the leash, your goal should be to get your dog to take five steps without pulling. Your goal should be to ask “a little bit more” from your dog each time you go out for a walk. This is how professional dog trainers train dogs: they focus on the next achievable step. And this is exactly what I did with Sophie. I didn’t show up one day and have one training session, and then she was magically transformed into a Lassie. It took many training sessions with a focus on improving her walking behavior a little bit each day. In fact, I kept a written journal of every training session I had with her, and I would highly recommend that you do the same. What went well during the training session (or walk). I’m a firm believer in celebrating successes no matter how small they are. This acknowledgement is also going to give you the emotional juice to keep going. What you need to work on in the next training session (or walk). This is the most important thing to write down, so try to do it immediately after your training session (or walk). Doing so will make your brain think about a solution rather than dwelling on the problem. And if you are a more advanced trainer, you may even want to videotape your training sessions. That way, you can review the footage and even ask for advice on possible training solutions. For the vast majority of dog owners, though, this isn’t practical or necessary. All you need is a simple notebook to use as a training journal. This is why my Walk in Harmony Game Plan is so effective: because I went through this process with Sophie and kept a written record of every one of my training sessions with her. I could open up my training journal right now and tell you exactly what I did during each training session. They are skills that you can teach inside your home where there are no distractions, and then once your dog has mastered them, you can utilize them outside to make walking your dog easier. For example, you can teach your dog to look up at your face. How useful would this be? Well, next time you are walking past a distraction, you can say “look at me,” and your dog will look at you instead. Or how about teaching your dog to control his instinct and not lunge or pull toward things on the ground? This is exactly what happens when you strengthen this skill. Simple. 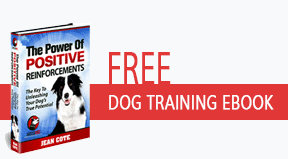 All you have to do is set aside ten to fifteen minutes a day and teach your dog a particular skill. I lay out all of my skill-building training games in my Walk in Harmony Game Plan, but here is one I played with Sophie. The objective was to teach her to ignore a pile of popcorn on the ground. As you can see from the video above, Sophie was quite persistent in the beginning. By the end of the training session, however, she had much better self-control. Imagine if you worked on this every day for a week or a month how much better your dog would be! In the second article of this series, I’m going to share five reasons why you should train your dog to walk on a loose leash (and to stop pulling) that are incredibly important. As a loving pet parent, you absolutely need to be aware of them. Click here to read part two. I have started teaching my dog (2 1/2yo Hunterway/Mastiff X) to walk beside me with this same method (the neighbors must think I’m mad for spinning in circles all the time). The issue I’m having is when I praise him for good behavior he thinks he’s done and begins to pull again. Is it simply a wash/rinse/repeat procedure or is there something more I can do to give him praise but keep him in his current (good) behavior? This applies to more than just loose leash walking. Great question! Try being quicker in your delivery of reinforcements (treats). If you can give your dog three treats one after the other while walking, BAM, BAM, BAM, your dog won’t have time to break the position. After the treats have been delivered, change things up by either speeding up your walk, changing direction or getting your dog to sit. Be unpredictable. In the beginning this means a lot of treats. But it also means no mistakes. If your dog does the yo-yo, where he goes to the end of the leash and back to your side, you’re unintentionally rewarding your dog for being wrong first, and then right. So practice rewarding quicker and more often when he’s at your side.